Dental implants, a revolution in dentistry, are the perfect solution to replace missing teeth or stabilise loose dentures. They are the new standard of care for people with missing or broken down teeth. You no longer have to rely on dentures, bridges or other removable appliances. And that means that we can help you smile with confidence and eat comfortably whatever you wish. At Smilekraft Dentistry, our experienced implantologist, Dr. Priyank Mathur, uses dental implants from Nobel Biocare, which pioneered and are the best system of dental implants currently being used in dentistry. These teeth implants will match your natural teeth, restore your ability to eat and speak naturally, and enhance your smile. Best of all, implants at Smilekraft Dentistry come with a lifetime replacement warranty. Visit our clinic to consult one of the best dentists in Pune, India, for his expert opinion on dental implants procedure. I am very pleased with the results. It has been 8 months since the completion of the treatment and I have had no problems so far. Dr. Priyank is very competent and well informed – a thorough professional with pleasing manners. He uses the latest technologies that ensure the minimum discomfort for his patients. The price for the treatment was pretty much in line with the initial estimates and the total cost to me was a fraction of what I would pay here in Canada. I am very happy to have found a clinic to take care of my dental problems. I went for a tooth implant (KOS). The clinic has excellent facilities and the procedure was completed in a short time without any discomfort to the patient. Dr.Priyank Mathur was very courteous and was helpful in taking the patient to the clinic and dropping him back .Excellent follow up and recommendation. I am very happy to have found a clinic to take care of my dental problems. Completely satisfied with the dental treatment I have received with Dr. Priyank at SmileKraft Dentistry. I was impressed with the time he took to answer my questions and explain the implant procedure before I arrived in India. There were no surprises during my visits and everything went like clockwork thanks to Dr. Priyank’s careful planning and clear communication. Their offices are clean, bright and very modern. His staff are courteous and friendly, they made every accommodation to make my office visits as comfortable as possible. I have no hesitation in recommending Dr. Priyank and SmileKraft Dentistry and will be returning in 6 months for my follow on procedures. I am from the UK. I went to PUNE in Jan, 2015. I learned about Smilekraft Dentistry from the internet. I asked him several questions especially about the sterile procedures. I have been fully assured about this. I had 6 implants done with one crown fitting. I am fully satisfied as to work done and the costs The doctor is kind and fully explains the procedures He spends time with you and it is not a hurried treatment. Very clean and the whole staff is very helpful. Doctor goes out of his way to help you. I would recommend this clinic to any one. Especially coming from abroad. I am sure doctor will not cheat you. He will not do unnecessary procedures. In this part of our website, you will find answers to some of the questions that may be running through your mind before you get a dental implant. Dr. Priyank Mathur, your Implant dentist, who has the experience, skill and artistic eye to restore your smile and function to full health, has explained it elaborately. You can also call our office to schedule a consultation appointment with Dr. Priyank at any time. Your teeth were designed to last a lifetime, but sometimes they don’t! Replacing missing teeth is important for your general health and for the health of your other teeth.Not only do you lose chewing ability when a tooth is lost, but teeth which are not replaced can cause other teeth to be lost, tipped or crowded and create subsequent problems. Also, there are the obvious problems of poor appearance and loss of self-esteem caused by one or more missing teeth. Dental implants should always be considered as an option to replace a failing or missing tooth. Dental Implants are an excellent way to replace a missing tooth or several missing teeth. They have been successfully used in dentistry since 1965 and are now a highly predictable, widely accepted treatment modality. A dental implant is actually a replacement for the root or roots of a tooth. Like tooth roots, teeth implants are secured in the jawbone and are not visible once surgically placed. They are used to secure crowns (the parts of the teeth seen in the mouth), bridgework or dentures by a variety of means. They are made of titanium, which is lightweight, strong and biocompatible, which means that it is not rejected by the body. Titanium and titanium alloys are the most widely used metals in both dental and other bone implants, such as orthopedic joint replacements. Dental implants procedure have the highest success rate of any implanted surgical device. Titanium’s special property of fusing to bone, called Osseo-integration (“Osseo” – bone; “integration” – fusion or joining with), is the biological basis of dental implant success. That’s because when teeth are lost, the bone that supported those teeth is lost too. Placing dental implants stabilizes bone, preventing its loss. Along with replacing lost teeth, implants help maintain the jawbone’s shape and density. This means they also support the facial skeleton and, indirectly, the soft tissue structures – gum tissues, cheeks and lips. Dental implants help you eat, chew, smile, talk and look completely natural. This functionality imparts social, psychological and physical well-being. To replace one or more missing teeth without grinding down adjacent teeth. Resolve joint pain or bite problems caused by teeth shifting into missing tooth spaces. To restore your confident smile. Restore or enhance facial appearance. Support a bridge or denture, making them secure and comfortable. Advantages of Dental Implants over Teeth Supported Bridges or Removable Dentures. Every way you look at it, dental implants are a better solution to the problem of missing teeth. An implant is the most natural, cost-effective, and least invasive way to replace missing teeth. Teeth implants look and feel like your own teeth! Since dental implants integrate into the structure of your bone, they prevent the bone loss and gum recession that often accompany bridgework and dentures. No one will ever know that you have a replacement tooth. Dental implants don’t sacrifice the quality of your adjacent teeth like a bridge does because the neighboring teeth are not altered to support the implant. More of your own teeth are left untouched, a significant long-term benefit to your oral health! Dental implants will allow you to once again speak and eat with comfort and confidence! They are secure and offer freedom from the irksome clicks and wobbles of dentures. They’ll allow you to say goodbye to worries about misplaced dentures and messy pastes and glues. The success rate of dental implants is highly predictable. They are considered the best option for tooth replacement. A bridge or partial denture will have to be replaced many times in your life, costing much more in the long-term, whereas your implants will last you a lifetime once done and maintained properly. 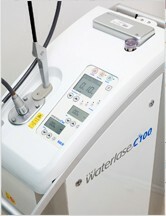 The only place in Pune to use the WaterLase Laser for implant procedures. The best quality dental implants from Nobel Biocare are preferably used, unless asked otherwise. Lifetime warranty on dental implants in Pune, India. At last, when done by Dr. Priyank Mathur, implant treatment usually produces minimal pain & discomfort. With the exclusive benefit of using the WaterLase to perform oral surgical procedures, it is ensured that the procedure causes minimal post-operative bleeding, swelling and discomfort. Dr. Priyank uses some very unique techniques that make the procedure very simple for patients. A single implant is a very common and regular procedure in our practice. 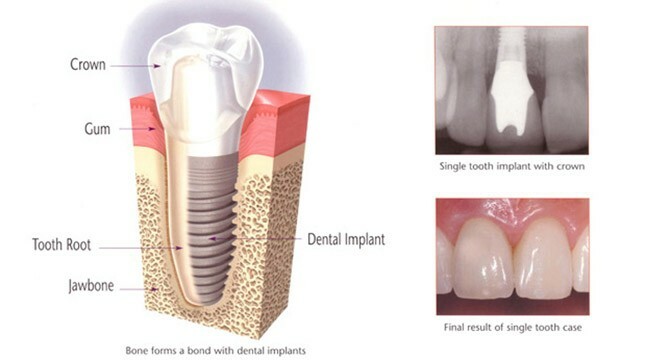 A dental implant can replace any tooth in the mouth. When either the tooth and root are damaged or a tooth is about to be lost, the best permanent replacement is a dental implant in conjunction with crown. An implant both looks and functions just like a natural tooth. A dental implant to replace one missing tooth is the most natural, cost-effective, least-invasive and long-term tooth replacement. This procedure normally includes one to four visits. Here is a more detailed description of the procedure to replace your single missing tooth using a dental implant. The course of treatment described here is one of several options available. An examination and one or more X-rays of the area are made to prepare for the procedure and diagnose your unique situation. The area will be checked carefully for any signs of bone or gum loss. The implant is placed. At this time, a temporary tooth is always provided for front teeth that allow you to eat and function like normal, almost immediately. The implant will need a few months to integrate with the jawbone before the next step is taken. The final step is the placement of the final ceramic tooth. The crown is cemented or screwed in place. End result: You can expect the new tooth to feel fit, and function just like a natural tooth. Do your usual dental hygiene to keep the tooth and gums around it clean and healthy. Consult our office to find out what the best solution for you is, given your specific condition. Having dental implants replace your lost teeth will give you new, unparalleled strength and stability that will allow you to eat what you want. It will also preserve your jawbone and facial appearance. The best option is a “fixed” (non-removable) alternative. Fixed teeth provide a stable, secure solution that lets you eat what you want. Dental implants also preserve your facial appearance and prevent bone loss that would occur if nothing were done. In the back of the mouth where bite forces are extremely strong, one implant per tooth is ideal. Although not always required, most patients prefer to have individual teeth rather than an implant bridge for the back teeth. With individual implant crowns, you will be able to floss your teeth normally. With an implant bridge, an easy to use floss threader will have to be used on a daily basis to get under the middle teeth. We will aid you in making the best decision for your particular situation. In the front of the mouth, we may recommend an implant bridge as opposed to individual front teeth implant crowns. The main reason for this is cosmetic. The natural shape of the gums is the “scalloped” shape and those tiny triangles of gum in between the teeth can be created more predictably with a bridge. At Smilekraft Dentistry, the aesthetic outcome of the “pink part,” the gums, is as important as the “white part,” the teeth. Many patients and doctors often neglect the aesthetics of the gum contours, which truly makes a tooth look natural. In addition, the bite forces are not as much as the back teeth, so fewer implants can be used. After the initial examination, you can expect 1-4 additional visits until the final fixed teeth are permanently attached. In this schematic, when replacing three teeth in the far back of the mouth, a fixed bridge anchored to dental implants is an alternative. Traditional dentures can’t offer the same stability or function. The course of treatment described here is one of the several options available. Individual teeth can also be made for a similar situation. Suppose three teeth at the back end of the mouth are missing. The only natural replacement alternatives are implants. The bridge contains all teeth in one piece and is anchored on dental implants. First, the implants are placed. This is normally done in a single session. A temporary bridge may be placed at the same time, making it possible for you to function like normal almost immediately after leaving the office. The implants need to integrate with the jawbone before the permanent bridge is attached. This is normally done 1-4 months after the implant installation. The time will vary, depending on the teeth affected and the aesthetic demands. The new bridge will handle all the pressure that your strong, natural back teeth did. You will have a stable and secure solution that will allow you to eat what you want. When all teeth are missing or need to be replaced, full mouth teeth implants are the best permanent solution. Before dental implants, there were no solutions available for people who lost all their teeth besides full dentures. Today, it is possible to replace a full jaw with dental implants and a fixed bridge or implant over-denture that results in a permanent, stable and highly aesthetic solution. In fact, dental implants have been used to replace dentures since 1965! Let you eat and function like having natural teeth. Are a solid, stable solution that will serve you for many years. Preserve your facial appearance and prevent bone loss. The treatment procedure and number of visits is largely dependent on the specific conditions. But all in all, a few visits should be enough to have the entire procedure completed. Most patients report that they were much more comfortable following the procedure than they had anticipated. The course of treatment described here is the general way in which most of the options are carried out. We determine what needs to be done by performing a very thorough exam. A panoramic X-ray will also be taken. In some cases, a CBCT or “CAT” scan may be necessary to evaluate your bone on a computer. The first step is placing dental implants to replace the lost tooth roots. Temporary teeth may be attached that would enable you to eat and function like normal while waiting for the permanent bridge to be installed. After about 2 months, the final bridge is securely installed on top of the implants. With a full jaw replacement like this, natural appearance and chewing function are restored. Your new teeth should be hard to tell from natural – both for you and others. People who have had traditional dentures before getting a fixed implant bridge often describe this as an overwhelming and very positive experience.